The U.S. national debt is once again raising alarm bells. Federal borrowing from outside investors expanded rapidly over the past decade, totaling more than $15 trillion in 2018, and it is projected to grow even faster over the next ten years under current law. Major budget legislation signed by President Donald J. Trump, along with continued growth in entitlements and higher interest rates, will see the debt nearly double by 2028 [PDF], coming close to the size of the entire U.S. economy. If the debt continues to grow at an unsustainable level, it could expose the country to a number of dangers, economists say. In the extreme, the risk rises that Washington’s lenders, many of whom are foreign, could suddenly lose confidence, demand higher interest rates, and trigger a fiscal crisis. Short of that, rising debt could gradually squeeze discretionary spending and deny the country tools it needs for security and economic stability. Reducing the debt, experts say, will require politically difficult decisions to either curb entitlement spending, raise taxes, or both. How did the debt get to where it is today? Over the next thirty years, sustained economic growth gradually reduced the debt as a percentage of the economy, despite wars in Korea and Vietnam and the establishment of Medicare and Medicaid. In 1967, the entitlement programs’ first year in existence, spending for both of them amounted to less than 1 percent of GDP. Overall, debt as a percentage of GDP bottomed out in 1974, at 24 percent. Beginning in the 1980s, ballooning defense spending and sweeping tax cuts ushered in a new period of rising debt. 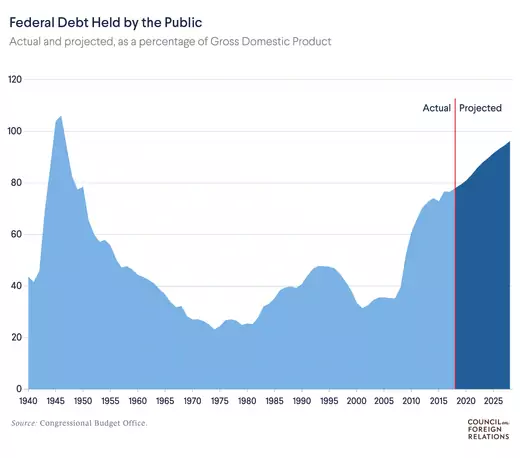 During the 1990s, a combination of tax increases, defense cuts, and an economic boom reduced the debt as a percentage of GDP and, beginning in 1998, brought four consecutive years of budget surpluses—the first such streak in forty years. Deficits returned under President George W. Bush, who oversaw a period of tax cuts, war spending in Afghanistan and Iraq, and major new entitlements, such as Medicare Part D. Annual deficits hit record levels—more than $1 trillion—under President Barack Obama, who, in response to the Great Recession, continued the Bush administration’s bank bailout program and provided hundreds of billions of dollars in fiscal stimulus. What does the current federal budget and debt look like? In 2018, the federal government spent $4.1 trillion while it took in just $3.3 trillion in revenue, leaving a budget deficit of almost $800 billion [PDF]. According to the Congressional Budget Office (CBO), a nonpartisan government agency, most of the federal budget goes toward entitlement programs, such as Social Security, Medicare, and Medicaid. Unlike discretionary spending, which Congress must authorize each year through the appropriations process, entitlements are mandatory spending, which is automatic unless Congress alters the underlying legislation. In the 2017 fiscal year, the most recent for which the CBO has provided its detailed breakdown, only thirty percent of federal spending went toward discretionary spending programs, with defense spending taking up roughly half that. Where is the debt headed? 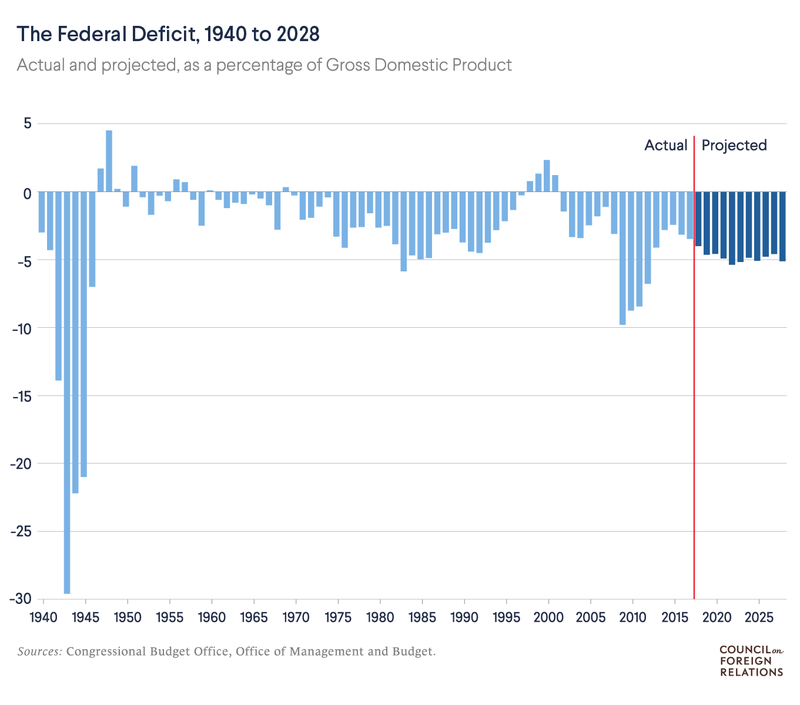 The CBO projects that annual deficits will breach the $1 trillion mark again by 2020 and remain above that level indefinitely under the current tax and spending regime. On this steep trajectory, the publicly held U.S. debt will nearly double to $29 trillion over the next decade. This would bring the number close to 100 percent of GDP, a level not reached since 1946. 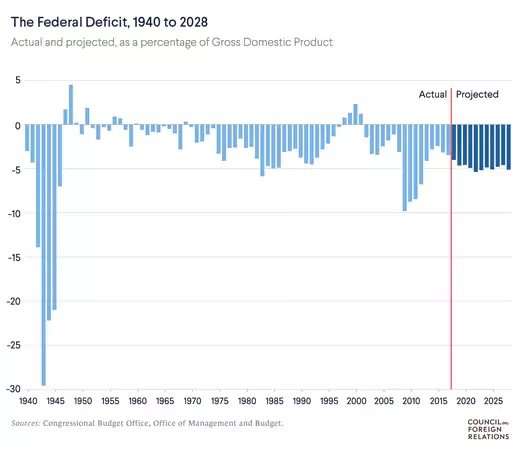 The CBO projects that annual deficits will breach the $1 trillion mark again by 2020 and remain above that level indefinitely. What are the primary drivers of future debt? The main drivers are mandatory spending programs, namely Social Security—the largest U.S. government program—Medicare, and Medicaid. Their costs, which currently account for 45 percent of all federal spending, are expected to surge as a percentage of GDP because of the aging U.S. population and resultant rising health expenses. Meanwhile, interest payments on the debt, which now account for 7 percent of the budget, are expected to rise relative to other outlays as interest rates rebound from historically low levels and debt continues to accumulate. 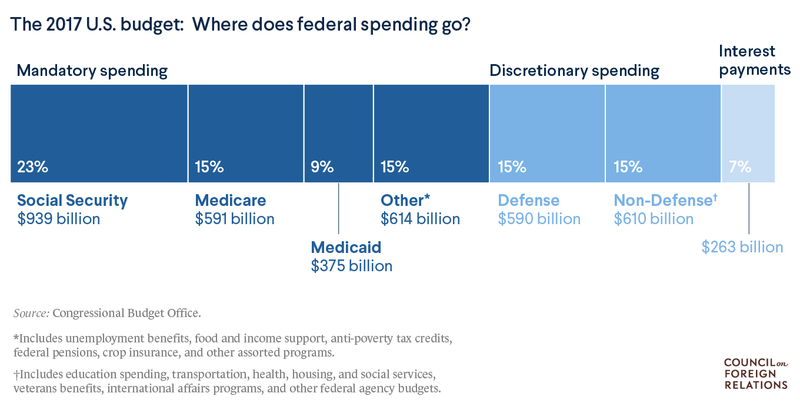 The discretionary budget, which includes spending on programs ranging from defense to transportation, is expected to shrink as a portion of the budget. How do recent budget measures factor into this? President Trump signed off on several pieces of legislation with implications for the debt. The most significant of these is the Tax Cuts and Jobs Act of 2017. Signed into law in December 2017, it is the most comprehensive tax reform legislation in three decades. Trump and some Republican lawmakers have said the bill’s tax cuts will boost economic growth enough to increase government revenues and balance the budget, but many economists are skeptical of this claim. The CBO says that by cutting both corporate and individual taxes, the Tax Cuts and Jobs Act of 2017—combined with the administration’s sweeping deregulatory moves—will increase savings, investment, and labor force participation, which the agency says will boost annual GDP by close to 1 percent over the next ten years. However, the CBO projects the law will add significantly to annual budget shortfalls in the coming years. Analysts at the agency say the tax cuts will add another roughly $1.85 trillion to the debt over the next ten years. Even more worrisome, they say, is a scenario in which many of the provisions that are set to expire by 2025, such as tax cuts for individuals, are renewed, which would pile on even more to the debt. Tax cuts will add another roughly $1.85 trillion to the debt over the next ten years. Spending deals passed in 2018 are also projected to increase the deficit. Congressional leaders agreed in February 2018 on a two-year budget deal, funding some discretionary programs through 2019. The deal raised discretionary spending by some $300 billion, increasing the deficit more rapidly than would have been the case under the status quo. Moreover, the legislation did not make any cuts to entitlements, a politically unpopular move that most budget experts say is nevertheless necessary to contain the debt. How does U.S. debt compare to that of other countries? The United States’ debt-to-GDP ratio is among the highest in the developed world. Among other major industrialized countries, the United States is behind only Belgium, Portugal, Italy, Greece, and Japan. What makes U.S. borrowing special? The United States has long been the world’s largest economy, with no record of defaulting on its debt. Moreover, since the 1940s it has been the world’s reserve-currency country. As a result, the U.S. dollar is considered the most desirable currency in the world. High demand for the dollar has helped the United States finance its debt, as many investors put a premium on holding low-risk, dollar-denominated assets such as U.S. Treasury bills, notes, and bonds. (These Treasuries are the primary financial instruments that the U.S. Treasury issues to finance its spending.) Steady demand from foreign creditors—largely central banks adding to their dollar reserves, rather than market investors—is one factor that has helped the United States to borrow money at relatively low interest rates. The bulk of U.S. debt is held by investors, who buy Treasuries at varying maturities and interest rates. This includes both domestic and foreign investors, as well as both governmental and private funds. Foreign investors, mostly governments, hold more than 40 percent of the total. By far the two largest holders of Treasuries are China and Japan, which each hold more than $1 trillion. For most of the last decade, China has been the largest creditor of the United States. Apart from China and Japan, no other country holds more than $317 billion. Why does rising U.S. debt matter? Economists say there are a number of risks associated with rising U.S. debt. It could divert investment from vital areas. Servicing an ever-growing debt, especially if interest rates rise significantly, will consume resources that could rob spending from sectors such as infrastructure, education, and basic research. It could shrink the U.S. global footprint. Without legislative action, interest on the debt and mandatory government programs, such as Medicare, will claim a growing piece of the budget pie, leaving fewer dollars for U.S. military, diplomatic, and humanitarian operations around the world. It could become a drag on the economy. Some experts argue that there is a tipping point beyond which large accumulations of government debt begin to slow growth. They posit that this could be a result of investors becoming more pessimistic about the economy as debt levels rise, which could rapidly drive up interest rates and thereby reduce private investment. It could precipitate a fiscal crisis. Many experts warn that if U.S. debt continues to rise, investors will eventually lose confidence in Washington’s ability to right its fiscal ship and become unwilling to finance U.S. borrowing without much higher interest rates. If many investors begin fleeing to alternatives, it may become prohibitively expensive for Washington to attract new buyers of debt, resulting in even larger deficits and increased borrowing, or what is sometimes called a debt spiral. A fiscal crisis of this nature could necessitate sudden and economically painful spending cuts or tax increases. It could hamper the country’s ability to navigate future economic crises. In the view of some experts, massive debt accumulation could undermine U.S. global leadership by eroding Washington’s ability to respond to future crises. Another major financial crisis, like that of 2008–2009, could require new large-scale stimulus spending, a response that would be difficult given the U.S. debt load. It could also constrain the nation’s ability to mobilize for an unexpected military conflict, weaken its global aid commitments, or siphon funds from the national security budget. Finally, it could leave the country vulnerable to foreign governments, especially China, that hold large chunks of U.S. debt and could potentially use the threat of a sell-off as leverage. “I think it's clear, if you do simple arithmetic, that the fiscal path that the nation is on is simply not sustainable,” said Erskine Bowles, the Democratic co-chair of President Obama’s bipartisan National Commission on Fiscal Responsibility, otherwise known as the Simpson-Bowles commission, at a 2012 CFR event. “And if I had to give you an analogy, I would say that the deficits are truly like a cancer, and over time they are going to destroy our country from within,” he said. However, a few economists, including Nobel laureate Paul Krugman, maintain that some of the debt concerns are overblown and suggest that Washington still has decades to tackle the problem. They say entitlement spending and health-care costs are not growing as quickly as predicted and that the cost of actually financing the debt—in terms of interest payments as a portion of GDP—is at its lowest level since the 1970s. Jared Bernstein, a senior fellow at the Center on Budget and Policy Priorities, warned at a CFR meeting in May 2018 about a “deficit attention disorder” that focuses too much on the issue. “We’ve been so outspoken about the downsides of these deficits, and they haven’t materialized,” he said. What are the policy options for dealing with the debt? Politicians and policy experts have put forward countless plans over the years to balance the federal budget and reduce the debt. Most include a combination of deep spending cuts and tax increases to bend the debt curve. Cut spending. Most comprehensive proposals to rein in the debt include major spending cuts, especially for growing entitlement programs, which are the main drivers of future spending increases. For instance, the 2010 Simpson-Bowles plan, which many experts considered the gold standard of deficit reduction plans, would have put debt on a downward path and reduced overall spending, including military spending. It also would have reduced Medicare and Medicaid payments and put Social Security on a sustainable footing by reducing some benefits and raising the retirement age. Raise revenue. Most budget reform plans also seek to raise tax revenue, whether by eliminating deductions and other tax subsidies, raising rates on higher earners, or introducing new taxes, such as a carbon tax. Simpson-Bowles would have raised more than $1 trillion in new tax revenue. Analysts estimate that the 2017 tax reform will reduce federal revenue by some $1.5 trillion over ten years. Budget experts discussed the drivers of the U.S. debt at this May 2018 CFR symposium. 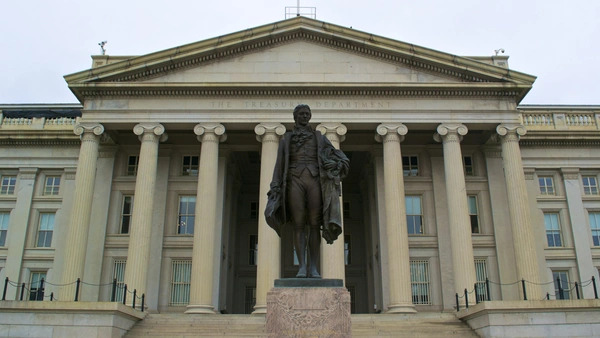 The U.S. Treasury provides daily tallies of the total U.S. publicly held and intragovernmental debt. The Congressional Research Service explains the dynamics of foreign ownership of U.S. debt [PDF] and discusses some of the leading concerns. The Congressional Budget Office highlights the primary sources of U.S. government spending, as well as the historical trends of debt and deficits. The 2017 Tax Cuts and Jobs Act will boost the economy, but not enough to make up for the plan’s lost revenue, explains the nonpartisan Tax Foundation. The main drivers of the debt are retirement benefits for the middle class, argues Harvard economist Martin Feldstein.